A point of interest in the images shown below is the dynamics taking place in the adjacent Sooke Lake Watershed, which is 98% owned and operated exclusively as a protected watershed by the Victoria Capital Regional District, in contrast to the uncontrolled and largely privately owned nature of the Shawnigan basin. Animation of true colour LandSat scenes (1984, 1998 and 2014) of southern Vancouver Island,and derived maps of vegetation changes. 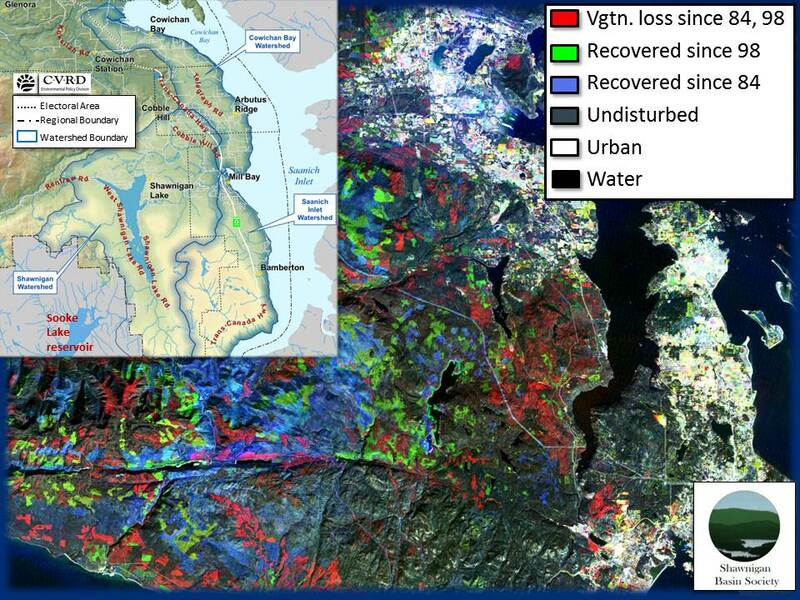 The first three images show water in blue or black, the vegetation in green, and de-vegetated areas in white (such as urban areas, roads, logged and mined areas). 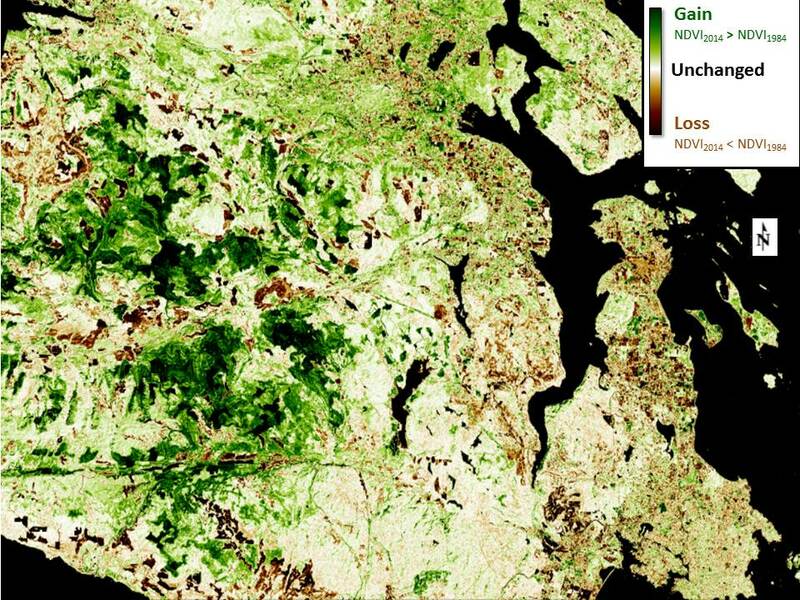 For more information on the maps derived from the LandSat data, please scroll down. The green reflectance bands (0.56 μm) of the three years were used to create a multicolour Red-Green-Blue (RGB) composite. This visual narrative illustrates the contrast between the recent forest conservation management strategy (old growth restoration) in the Sooke Lake watershed. This has led to forest recovery (green and blue areas southwest from Shawnigan) compared to the Shawnigan Watershed, where industrial forestry, mining, soil dumping and urban pressures have led to extensive forest losses, as indicated by the bright red coloured areas. The Normalized Difference Vegetation Index (NDVI) is a well-known index in remote sensing that provides a measure of green vegetative cover using the red (0.6μm) and near infrared bands (0.8μm). This image was generated calculating the difference between 2014 NDVI and 1984 NDVI on a pixel-by-pixel basis. The resulting image provides a gradient of values which indicate ‘a vegetation gain in 2014’ (green) and a ‘loss of vegetation in 2014’ (brown). The areas with no significant net changes (white) may have not been disturbed, may have been re-vegetated or re-disturbed to the similar levels.